Our club has a long history and many stories to tell and some excellent information about sea kayaking. What started out as black and white newsletter has evolved into a glossy, full colour, quality paper magazine of 40 to 50 pages that we lovingly refer to as "Salt". Receiving a quality paper copy and the ability to download current soft copies is just one our membership benefits. Want to contribute content or advertise in our Club Magazine? 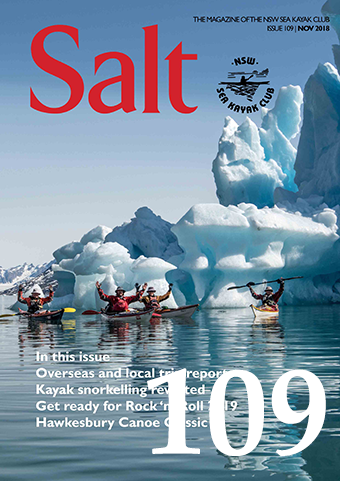 Our club magazine NSW Sea Kayaker is distributed to approximately 250 Club members, who are our main content contributors. The advertising rates are now available through the net in PDF format (26KB). You may need to install the Acrobat Reader software to access this document. For more information about rates or advertising bookings please contact the magazine editor. Please note! you must be logged on to read / download the latest last 3 editions of the SALT magazine. 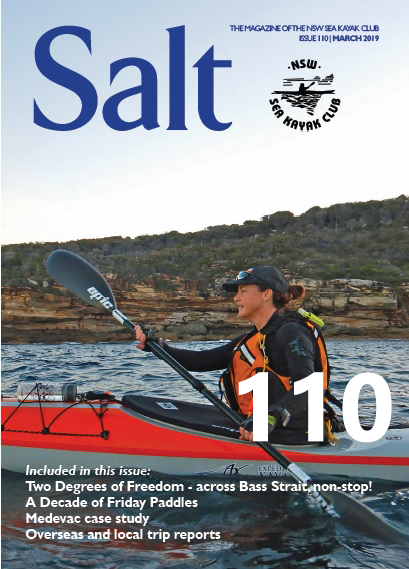 NSWSKC Club Magazine Index : This spreadsheet lists all magazines and the articles in each right through from the first NSW Sea Kayaker to the current issue of Salt Magazine. The spreadsheet allows users to search on articles, authors, paddling locations, and types of articles. Please note! You need to be logged on to read / download the last 3 issues of Salt.